This post is sponsored by Talkspace. I have mentioned before that in my 20s and 30s, I worked as a licensed marriage and family therapist doing counseling with individuals, families, and couples. It was a job I really enjoyed, because I truly believe in the value of therapy and that it can change lives and free people from unhealthy patterns of behavior and ways of thinking. 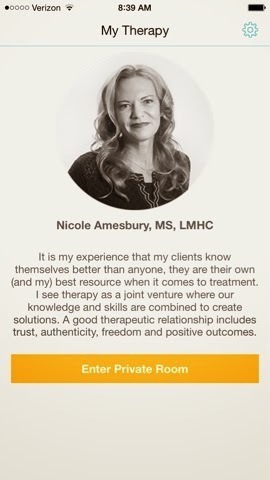 My husband is also a marriage and family therapist, in full-time private practice here in California. We have often joked about the therapy fund we need to start for our children for having two parents who are both therapists. Of course, all of that training means that we never fight, have perfect communication, and parent our kids with precise patients and the perfect mix of logic, love, and discipline. Also we have a pet unicorn and tiny birds clean my house. My husband and I have both had therapy over the years from the other side of the couch, both together and individually. Unfortunately, sometimes I think therapy gets a bad rap. People assume that it is something you do only if you are in crisis, or that you would only seek marital therapy if you were nearing a divorce. For me, therapy is just like any other aspect of my health . . . like going to the doctor to get a check up or going to the dentist to make sure my teeth are okay. From my years of doing therapy, it is my opinion that it tends to be higher functioning people that seek therapy outside of a crisis. So I am always open to having a mental health check-in. One of the barriers for me, in terms of seeking counseling on a more regular basis, is the fact that therapy hasn’t quite caught up with our modern ways of doing things. It usually involves making a phone call, which shouldn’t be that big of a deal but somehow is, because I’m so used to the convenience of doing things online. And then there is the difficulty of making an appointment, which usually means trying to fit together the puzzle piece of my crazy schedule with the available slots at a therapists office. And then making the appointment and getting there and either securing childcare or using up my workday – sometimes it hard to fit in into my schedule. There is a new website that is offering therapy services in a unique way that caters to those of us who prefer the convenience of online scheduling and remote communication. It is called Talkspace, and they offer text messaging therapy with licensed mental health professionals. Its convenient and affordable. The therapist comes in on a schedule, usually one to two times a day, most days of the week, and responds with brief, digestible doses of therapy. Your therapist follows you as you go about your life with consistency. This gives the therapist a really good snapshot of your day to day life as you go. 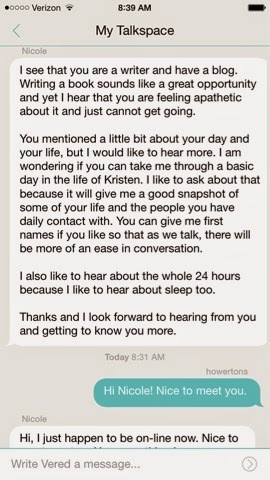 If you use the mobile app, it really is like having a therapist in your pocket. Have you done therapy before? How did you feel about it? What are you thoughts about using an online therapist?